Joyce's love of traveling to France and admiration for the Impressionist works of Claude Monet, took an amazing turn as she received permission for a private painting session in Claude Monet's Garden in Giverny, France. Going to the source of inspiration for many of Monet's incredible paintings was a dream come true. 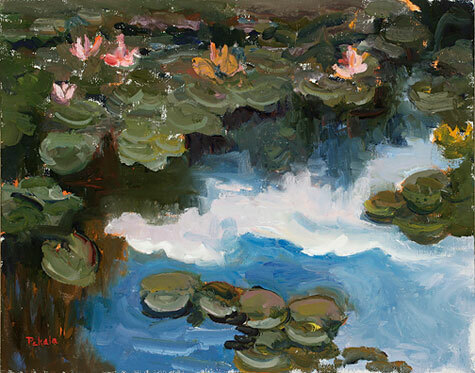 Her work "Les Nymphaes" is a tribute to the beauty of Monet's Garden and the legacy that was left behind in his living water garden. 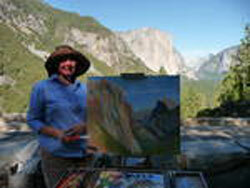 Joyce was selected to be an Artist in Residence at Yosemite National Park by the Yosemite Renaissance Board. After receiving word about her award, Joyce realized that she would be following in the footsteps of previous Yosemite artists such as Ansel Adams, Wayne Thiebaud, Marcia Burtt and others.The painting "Indian Village Yosemite" is now in the permanent collection of The Yosemite Museum Gallery, Yosemite National Park. Many of Joyce's paintings have been commissioned to become larger works from her on location field studies. Please contact her directly to discuss a specific location or size for your commissioned painting. Les Nymphaes, Oil on Canvas, 11"x14"